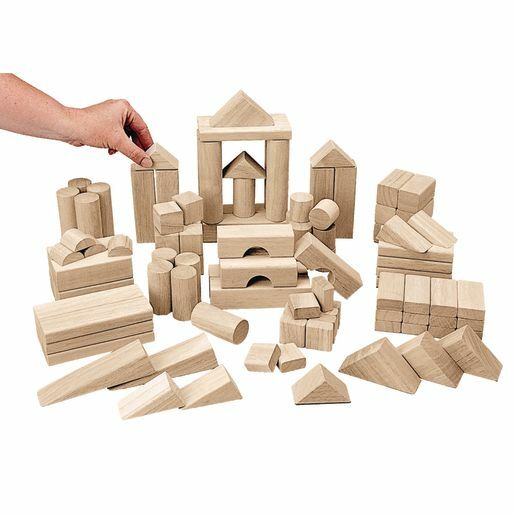 Solid ruberwood unit building blocks encourage problem solving, enhance social and perception skills, promote shape and size recognition and teach basic math and science skills. Smooth, sanded finish. All blocks are based on a unit measurement of 1-1/4". This base unit measurement gives each set complete uniformity for successful "architecture." This set is a wonderful combination of tabletop size blocks and blocks that are a little larger in size. The smallest block is 1-1/4"L and the largest is 5-1/2"L.